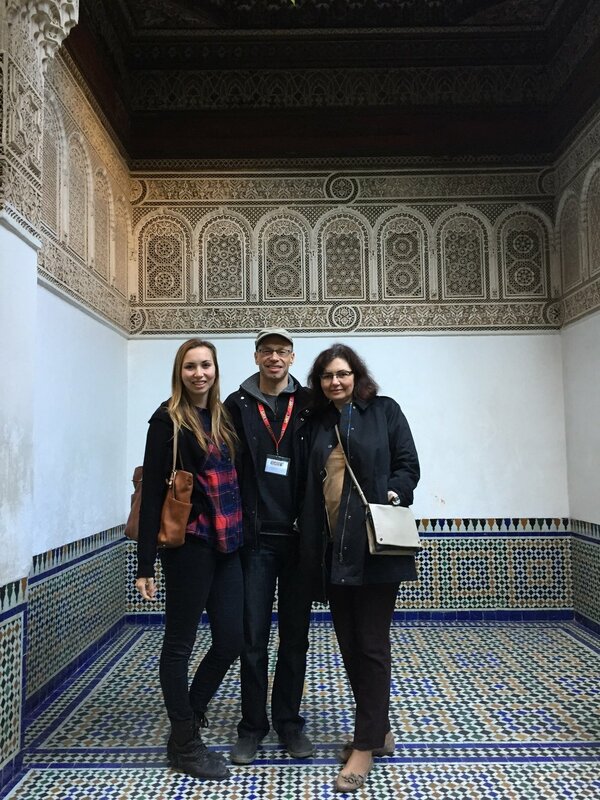 Prior to Remote Year, I spent almost two weeks in Morocco with my parents on our annual Christmas trip. 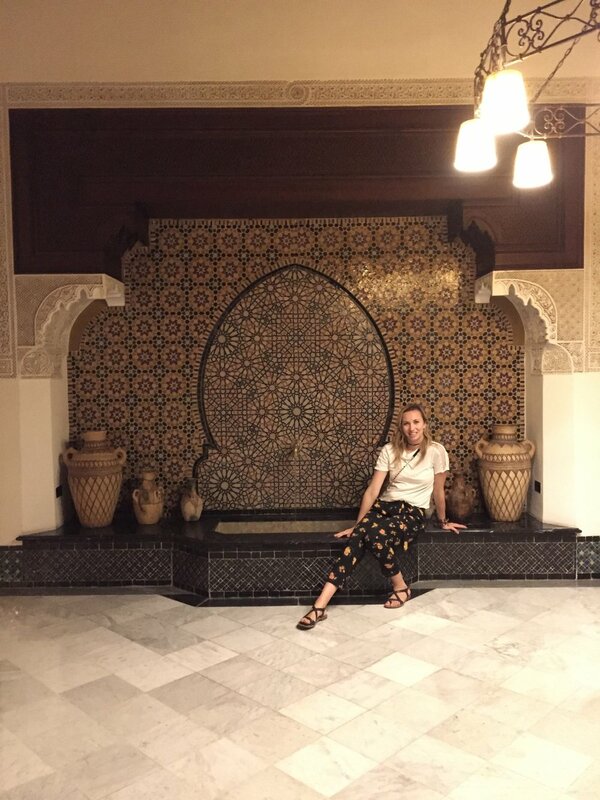 At the time, we found Morocco to be incredibly exotic and all the patterns, colors, architecture and culture to be exciting - all the typical first impressions and notions that a tourist has of Morocco. 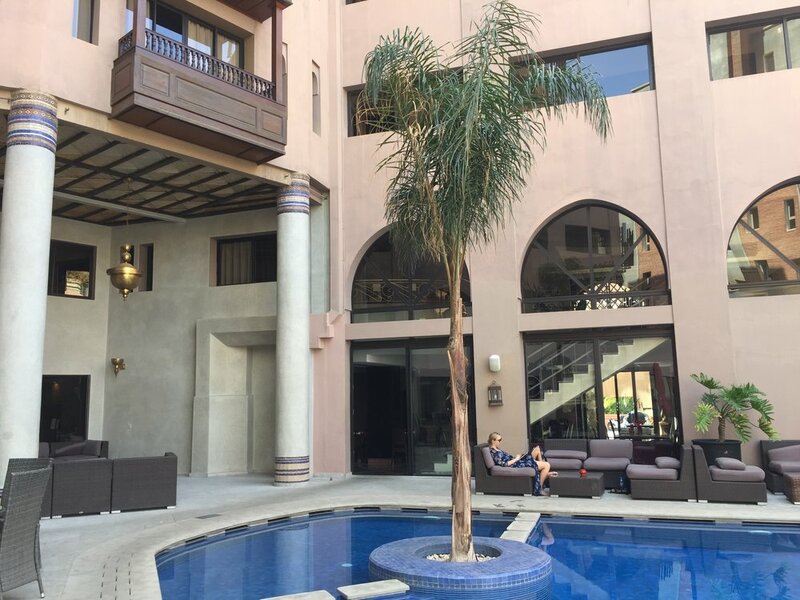 With Remote Year, I had the opportunity to live in Marrakech for five weeks instead of doing a whirlwind tour of the country, so my impressions were much richer. Digging one layer deeper, Marrakech seemed like a city in its awkward teenage phase - there was such a mix and medley of sights, sounds, smells...it could be easily overwhelming at times. The city certainly felt as if it was in the midst of an identity crisis. Although it is obviously very old and has strong traditions, the people seemed at a loss on how to embrace the new, emerging world. There’s a huge clash between old and new, traditional and modern, very poor and incredibly rich. Within minutes, you’d see a woman walking down the street with a full burka, then see a local young woman wearing a short skirt and form fitting blouse. The variety across the city can be confusing for an outsider to get a true pulse on the city. Outside of the huge contrast amongst city inhabitants, the city itself felt like an assault on the senses at times...I know that some within our group never really got used to the bartering, noise, hustle and general bustle of Marrakech. The medina especially can be extremely overwhelming. There was a feeling of getting ripped off at all times, even when doing the smallest daily interactions, like getting a cab. 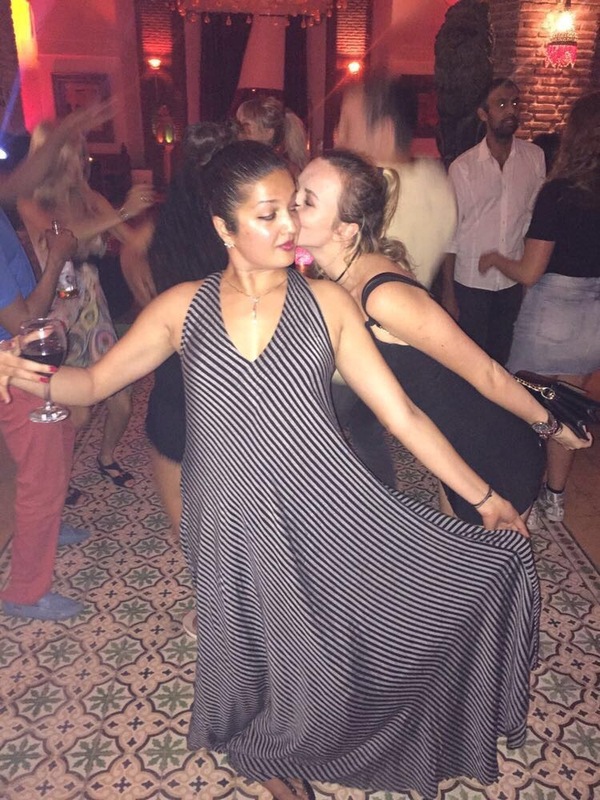 I personally ended up liking Morocco, although it took some time. I ended up becoming obsessed with the ability to do luxury on the cheap. It’s very easy to treat yourself lavishly on $50 or so. And treat myself I did. Read below on my top five about my heavenly spa experience at Les Bains. On a deeper, emotional level, I felt a little like an outsider within the group for the first part of the month….like I needed to reestablish my place within my friend group once more. I was coming back from an absence both literally and metaphorically. Literally in that I was coming back from a 10 day trip to NY which took up the first part of our month in Morocco, and metaphorically in that the three months prior I was in a relationship with someone who temporarily joined our group, meaning a lot of my time during those months was spent with him vs. with my friends or the group as a whole. That naturally made me unintentionally a bit more antisocial, so coming back from those two things, I felt a little pause when diving back into the group. I felt a bit awkward at times, but this didn’t last too long. By the end of the month, I fell back into the swing of things and the fold of the group. Grateful for the many, many opportunities Remote Year provides that allows you to bond with the group, which made my self-inflicted apprehension short lived. One of my closest friends from grad school, Sam, visited me for a week in Morocco, and we were able to go to Ouzoud waterfalls together. We had a small group tour with a really caring, funny tour guide who knew five (5!!!!) languages. There’s nothing like someone who’s fluent in multiple languages to make you feel inadequate. Ouzoud was outstanding - we were able to see multiple waterfalls, hike through a forest with some friendly monkeys, and take a boat ride that brought us to a spot where we could walk underneath one of the largest waterfalls. A four hour spa session at Les Bain was complete sensory heaven. Complete. Imagine walking into a candlelit room where rose petals line the stairs, leading you to two bath tubs. The baths are both drawn, one slightly warmer than the other, depending on your preferences, and rose petals are floating on the tops of the water as well, inviting you in. Incense is burning in the corner, providing a steady light musk scent to ebb into the air. Through some speakers, light strumming of a guitar envelopes the room. The water greets you warmly as you enter into the bath, allowing you to float easily and give yourself to the atmosphere. One of my all-time favorite memories from the year, our makeshift water aerobics class led by “WetBoyz,” resident funny men Ryan and Nick, was half-insane, all giggles. Take a look at their blogs as well, if you take a fancy, as they are truly hilarious. 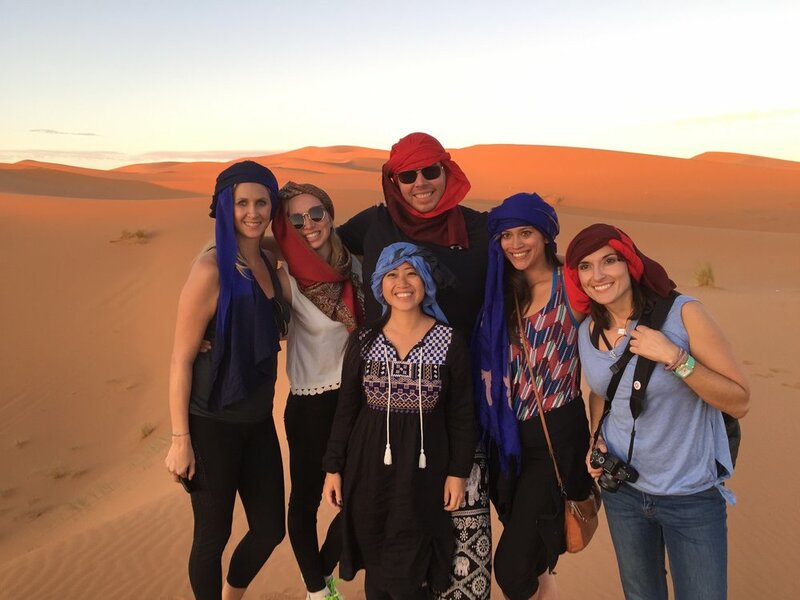 One of the best parts of being in Morocco was the ability to go on a Sahara Desert trip with almost the entire group, where the icing on the cake was sleeping out under the stars in the desert for a night. Led into the campground on camels, we settled into an amazing meal and got into a drum circle with some local berbers. In the midst of all the activity, a few of us thought that the large dune behind us looked incredibly tall and its peak unreachable. Well, #challengeaccepted. We set off to climb the dune and despite wanting to give up more than anything, myself and 7 others made it to the top after many vertical sprints up the sand (and lots of breaks). After what could be a new interval training session at Barry’s Bootcamp, we were able to relish our victory and take in the views of a distant desert city, the sprawling dsert, and the silence of the night around us. 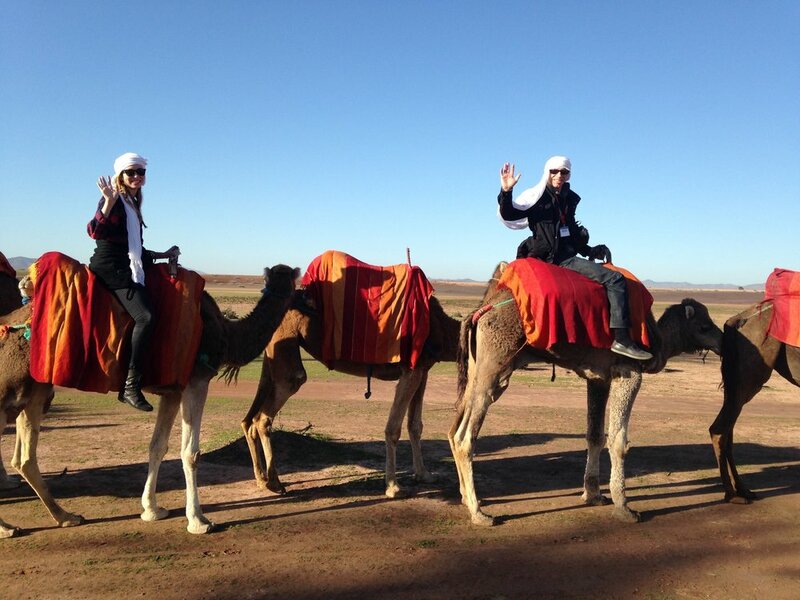 From my previous trip to Morocco, but the camel riding was familiar!